Many species of birds visit the river behind our apartment building. The one pictured can dive completely under water from a swimming position to catch fish. 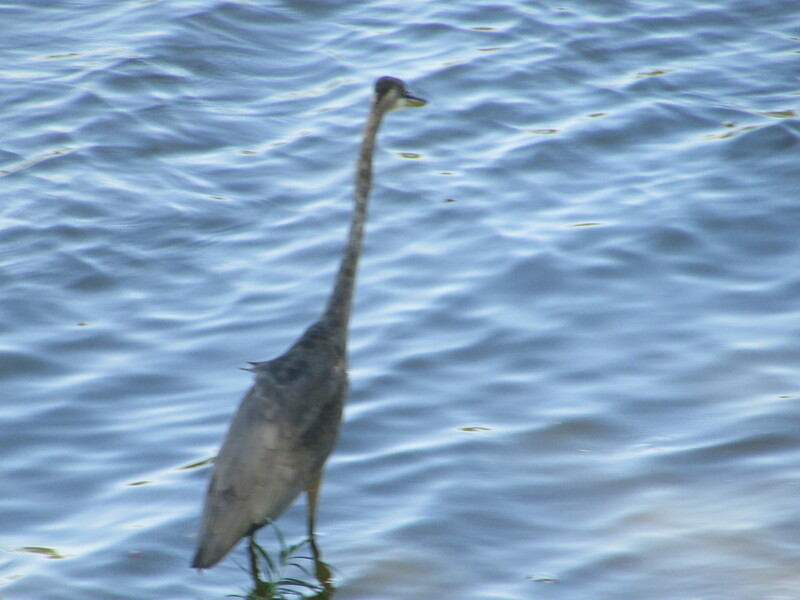 He swims low in the water and uses his tail feathers as a fanned rudder while he trys to locate his dinner. His fan tail, hooked beak, and black-webbed feet (not visible in this photo) identify him as a juvenile Cormorant. A group of Cedar Waxwings visited the backyard a few days ago. I was able to get nice shots that highlight the “red wax” tips on the wing feathers. I’m always happy when I can get a view of the bird’s claws clutching the branches in the trees as he observes his surroundings. The Cedar Waxwing is named for these red tip “wax-like” highlights seen in these photos. In http://www.horsesandanimalsaretalkin.wordpress.com “Kissing Cardinals”, Honey told Lionel she wanted plastic to line her nest. P.S. In last night’s storm, most of Honey’s hard-earned plastic blew out of the nest prior to her beginning her final egg-laying repose. Cardinals have been gloriously prevalent in our backyard this Spring! 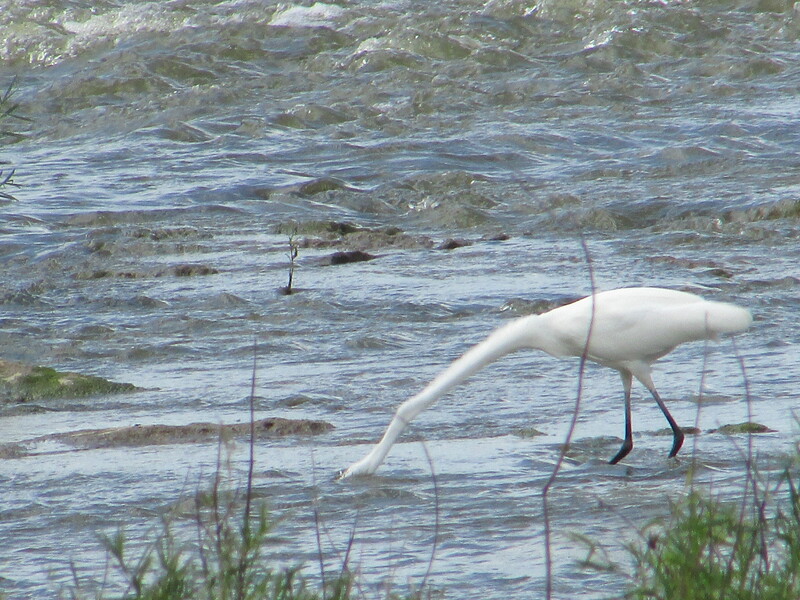 Here is the female partner of our fabulous pair gathering nesting twigs for her work along the Maumee River bank. She takes on most of the nest-building duties. She is more careful to stay hidden, using her camouflaging feathers. Although the beautifully red male does contribute a few items to the nest now and then and visit the female to check her progress and offer encouragement, his main objective is to guard the operations. And he makes no bones about his presence, standing tall and alert and visible. From his heights, he continuously watches over his female partner and whistles and signals to her whatever messages are necessary. This stubby little fellow seems to be seeking companionship. He usually travels in a flock! I didn’t know exactly what type of bird he is and couldn’t find him in my bird book until a friend suggested he was an American Coot. And that he is! American Coots are more of a Southern bunch, so seeing this single fellow standing alone near the bridge in the Maumee River at Napoleon, Ohio, was quite the rarity. Though stubby, this specimen can dive under water as far as 10 to 25 feet to find food, mostly seeds, roots, and leaves, as well as small fish. 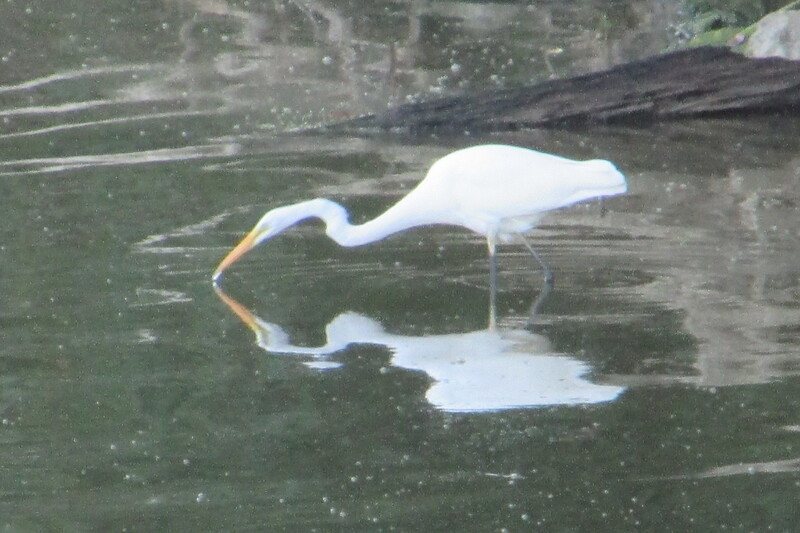 A Great White Egret fishes along the shore of the Maumee River. Possessing an extensively long neck, he can secure his catch well underwater, then brings his prize to the surface and quickly swallows it whole. We are lucky enough in our small town of Napoleon, Ohio, to have a big river — the Maumee River, which runs all the way to Toledo and Lake Erie — and to be able to enjoy some big birds that frequent the waterway. Napoleon is cradled North and South of the river and is located between Grand Rapids, Ohio, (east) and Florida, Ohio, (west). 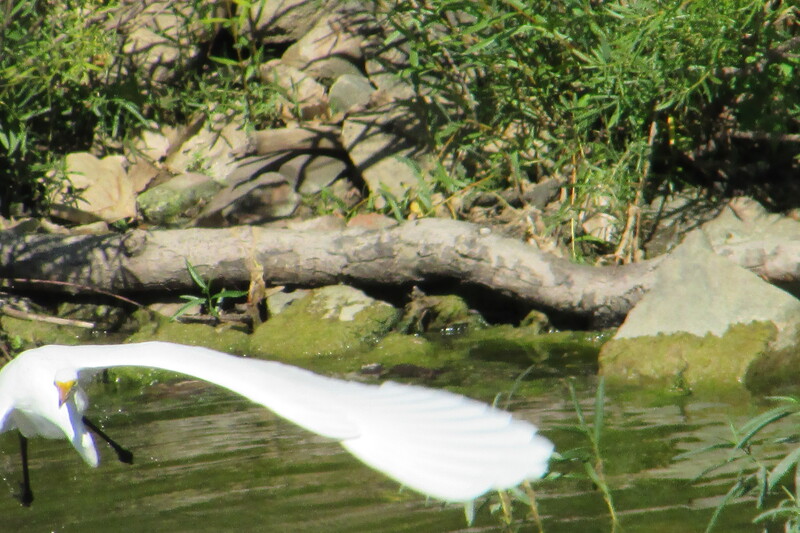 In late Summer and early Autumn, we can photograph Great White Egrets and Great Blue Herons, both pictured below as I captured them “fish-hopping” in the Maumee. 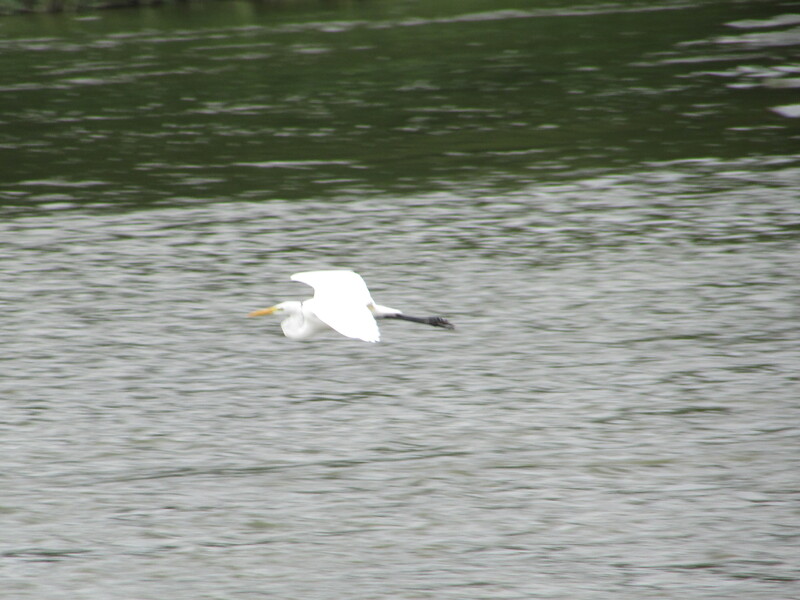 The top picture is a Great White Egret (black legs, yellow peak) shown rising into take-off from the water with just one wing showing. As you can see, he has an amazing wingspan! The second picture shows the long, long neck both these big birds possess. The length is very handy for catching fish under water. 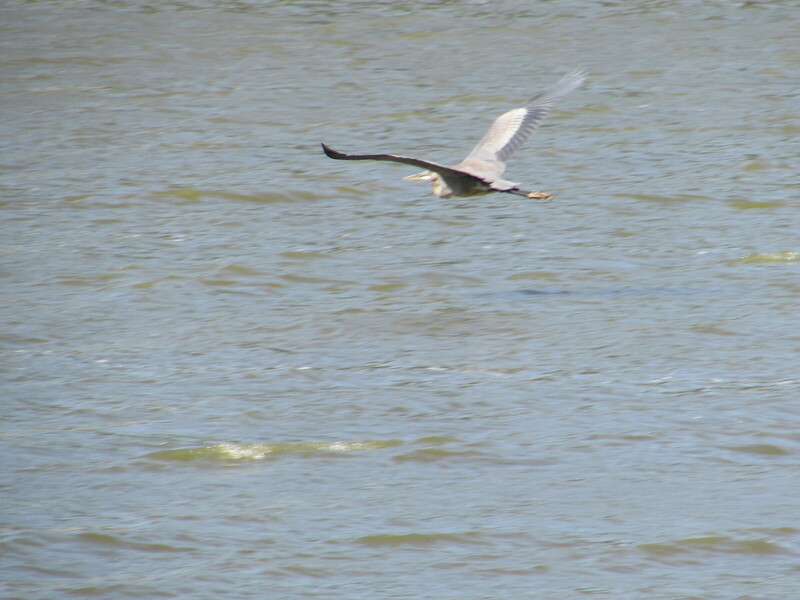 This photo also demonstrates an apparent gray-blue color of a Great Blue Heron at standing rest. 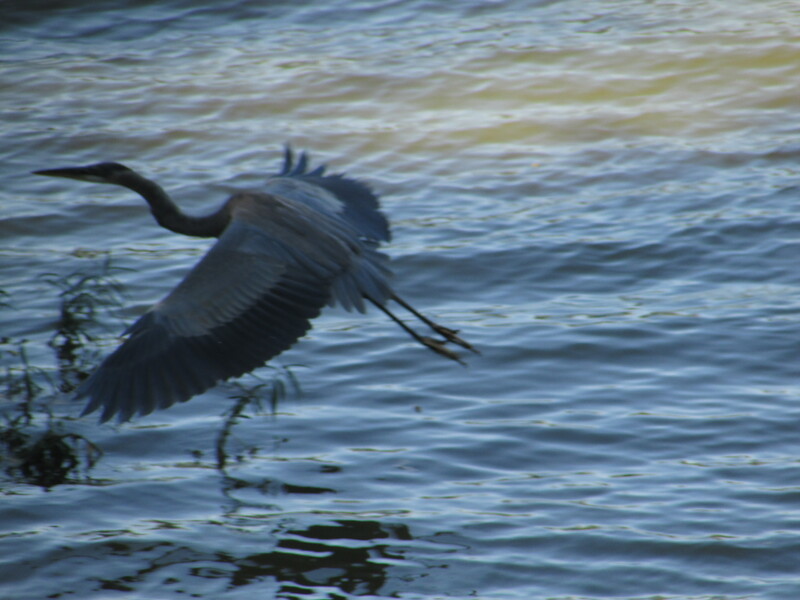 In the third photo, a Great Blue Heron shows darkened colors as they appear in low light while he prepares to land at his favorite fishing spot. Gliding over the river in brighter light in the fourth picture is a Great Blue Heron displaying his full wingspan and true colors of white feathers with bluish-purple trim. In the last two photos, you can see how both birds pull in those long necks during flight. Observe the heron’s (top photo) yellowish-black legs extending beyond his short tail feathers and the egret’s (bottom photo) all black legs.